While luxury goods purchase in physical stores has been growing by 3% since 2013, online sales have a solid 20% growth reaching USD 9 billion. Luxury e-commerce became a strong luxury news among brands, not only because technology allows a better online user experience but more and more brands have embraced the e-business era. Currently online sales in the luxury industry represent only 7% of total luxury sales in the world but in the next 5 years it should grow aggressively and reach a total USD 22.5 billion. Already today, we know that more than half of all luxury purchases have a digital component in the purchase path. In deed, more than 50% of luxury buyers get information online before acquiring a luxury good or service. 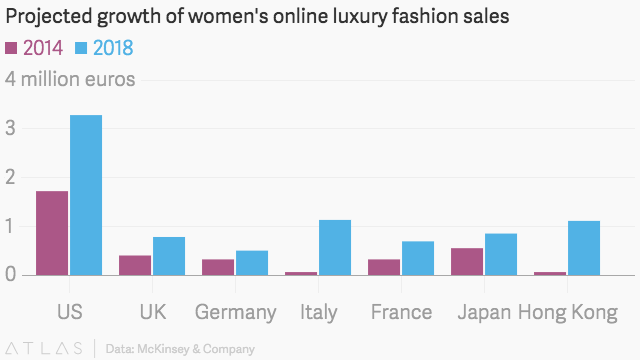 As we can see here in this chart, countries like the US but also Italy and Hong-Kong will have a strong growth in online luxury sales. Knowing the importance of luxury on these markets, it represents a significant evolution. The pervasive belief was that luxury shoppers, with their discriminating taste and preference for high-priced goods, wouldn’t buy expensive things online; they would always opt for the personalized customer service and tactile shopping experience that monobrand brick- and-mortar stores provide. They would have enough money and time to go to the physical stores and even fly to the country of origin. That thinking has evolved in recent years. The success of ventures such as Net-A-Porter has shown that consumers are indeed willing to buy luxury products online, and at undiscounted prices. 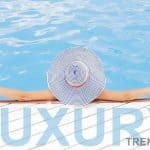 Everything indicates that luxury companies are recognizing the increasingly important role that the Internet plays in luxury shoppers’ purchasing decisions. As for social networks, luxury shoppers use them—but mostly to do research or retweet other people’s posts, not so much to post their own comments. The analysis of the content of social-media posts revealed that luxury shoppers use different social networks for different reasons. For example, they use Twitter primarily as a way to learn about or comment on live events in real time, whereas they look to Facebook mostly for information on promotions or discount coupons. On blogs and forums on media websites, most user comments are about in-store experiences or specific products. One way for brands to capture the social-media opportunity might be to identify and nurture “online ambassadors”—individuals who have a following among luxury consumers and will promote the brand on various social networks. In addition, brands should develop a social- media strategy that aligns with the way luxury consumers use the various social networks: Twitter for building and sustaining excitement around events as they are unfolding, Facebook as a delivery system for targeted marketing offers (while, of course, maintaining a level of exclusivity appropriate for a luxury brand), and popular blogs to engage with and influence consumers as they are thinking about specific stores or products. Digital tools and technologies are revolu- tionizing the luxury-goods industry, and no luxury brand can afford to ignore them. Online sales—as well as the influence of mobile and social media on offline sales—will continue to grow rapidly, in both developed and emerging markets. The most forward-looking companies are testing digital opportunities across their entire organization, monitoring impact closely, and scaling up effective approaches quickly. All other luxury companies should follow their example or else risk falling far behind. info sourced at McKinsey study about Luxury, internet and social media. All content is copyrighted with no reproduction rights available. Images are for illustration purposes only.